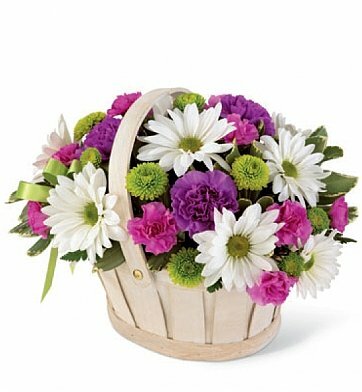 A charming basket is filled with garden-fresh blooms such as daisies, button pompons, miniature carnations, and more. Delivered fresh to the recipient's door, this lovely arrangement is the perfect choice for a birthday, thank you, or just because. Arrives in a charming wicker basket. Measures approximately 9" x 12". Blooming Bounty Bouquet is a hand delivered gift. These gifts are delivered by one of our local design centers located throughout the United States and Canada. Same day delivery is available for most gifts when ordered before the cutoff time. The cutoff time for Blooming Bounty Bouquet is 2 PM in the recipient's time zone. I ordered this bright basket for my daughter-in-law while she was in the hospital. My first time ordering flowers and I am thankful I came here. Flowers delivered promptly and made the recipients day soooo much brighter. Thank you for a beautiful basket and perfect service.. When ordering flowers on-line, sometimes you never know how they will actually look on arrival. I got to see for myself the beautiful arrangement and was very pleased- as was the recipient- will use your service in future. I sent this arrangement to congratulate my 14-year old niece for a great performance as Ariel in her school play "The Little Mermaid". She LOVED it! She called me to say how beautiful they were and how much she loved them. I saw her for Easter (2 weeks later) and she again made a point of telling me how beautiful the flowers were and how much she loved the whole arrangement including the little basket. Thank you for making my niece's day! Sent as a gift to my niece after surgery. She loved these flowers and it did brighten her day. I am new user to this web site and will definitely use again.